Art Nouveau floral gold pin Lady profile signed Zacha: Description by Adin Antique Jewelry. 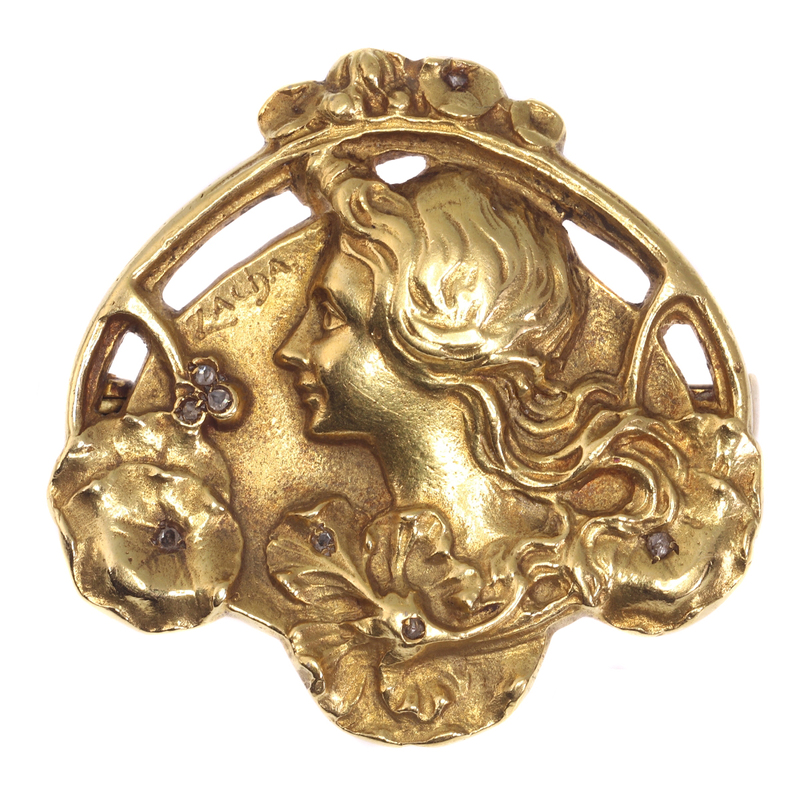 In this 18K yellow gold Art Nouveau brooch from 1900, an openwork aureole topped with morning glory arches over a scenery with in the centre the profile of a fair maiden letting her locks lash in the wind. On the left and right bottom, a morning glory glooms as an iris flaunts by the neck of the lady. Dispersed over the hearts of the flowers, seven rose cut diamonds glisten from the warm yellow gold glow of this antique jewel. Country of origin: Unknown, but because of the nature of the name "Zacha" (signed in the piece), we wouldn't be surprised if it was made in central Europe. Diamonds: Seven rose cut diamonds and senailles . A senaille is a simplified rose cut diamond, a small diamond chip with perhaps a few polished facets. We do not have the weight of the rose cuts diamonds nor the senailles which is normal in our trade when it comes to rose cut diamonds and senailles. Signature: "Zacha", a name that we haven't found any information on.